Tired of weeds taking over your flower beds or garden? Sick of spending time pulling weeds? Want a stronger, healthier, better-looking landscape? We’ve got the solution—schedule our mulching services! Mulching is one of the most effective ways of controlling the growth of weeds. Not only is it an effective form of weed control, but it also helps to protect the health and beauty of your landscape. 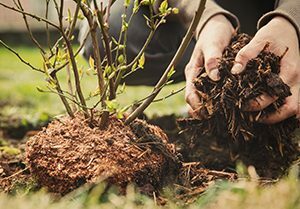 The process of mulching involves spreading a protective layer of either organic materials (bark, straw, grass clippings) or inorganic materials (stone, plastic) to your landscape. Mulching has a number of long-lasting benefits on both the health and appearance of your landscape. Contact us today to learn more about our mulching services. At our landscaping company, we have the experience, expertise, and equipment to promptly deliver and spread mulch, saving you time and energy and helping to keep your landscape looking great. Whether you want to add mulch to your shrubs, garden, or flower beds, our lawn care experts will work with you to find the mulch option that best meets your preferences and landscaping needs. Our landscapers are trusted, reliable, professional, and committed to your satisfaction. We have over 10 years of experience, and we take tremendous pride in every job we do. Regardless of the service, we treat each client as though they are our only customer, and we are firm believers in the idea of doing it right the first time. Have questions about our mulching services? Want to schedule an appointment? Drop Us a Line or give us a call at 225-217-6792.